Hard to believe it’s been over five years since I filmed Christin & Kyle’s wedding, but it was a joy to be reunited with their families for Sarah & Jeff’s big day in Muncie. After preparations with Karen Hall, a first meeting and some photo time with Sarah Lawhorn at First Presbyterian Church, the couple enjoyed a lovely ceremony, while some of their guests undoubtedly entertained themselves with the cute little word search puzzle in the programs. I barely beat the rain to the Cornerstone Center for the Arts, the same place where Wedding Entertainment Director Jim Cerone and I had collaborated on Christin & Kyle’s reception five years earlier. After a few formalities including a tear-jerking speech by the father of the bride and a cake cutting that was a “smash,” the guests were ready to tear up the dance floor once again as Mr. Cerone presided over the evening’s events with his usual professionalism. For a second straight year, I was honored to film the Blissful Wishes Ball, an annual fundraising extravaganza benefiting the Indianapolis chapter of Wish Upon a Wedding, which is a non-profit organization that provides weddings to couples facing terminal illness or life-altering circumstances. The festivities took place at the Landmarks Center, which was stunningly transformed into an eye-popping “Arabian Nights” experience by a supremely talented team of event pros. From the early formalities to the food, music & many other surprises, it was truly a magical evening surrounded by so many great friends, which made the footage even more fun to put together. Best of all, the gala raised well over $20,000, ensuring that couples who truly understand the meaning of “in sickness and in health” can enjoy a beautiful wedding provided by Wish Upon a Wedding’s dedicated team of wish-granters. 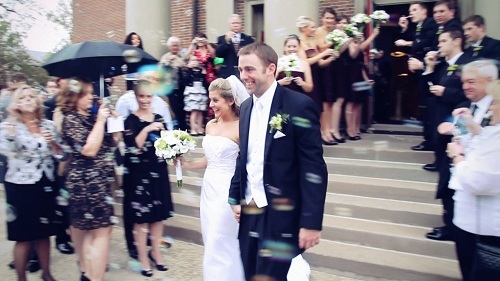 To learn more about this great organization, visit http://wishuponawedding.org. After a first meeting between Beth & Ronan at her family’s home, everyone headed to Second Presbyterian Church for photos with Sara Morris. Following the ceremony, guests were greeted at the Woodstock Club for cocktails in a stunningly designed tent that only hinted at the splendor awaiting them inside the club for dinner. The happiest father of the bride I’ve ever seen presided over the evening’s formalities before everyone moved back into the tent to dance to Lipstick Blonde‘s retro rock under another spectacular arrangement of flowers. McNamara‘s Alan Thompson, AIFD (who referred Beth & Ronan to us) was the creative mind behind all the floral the fabulosity, and planner Anne Rogers worked hard behind the scenes to make the whole day run to perfection.